GET READY FOR THE ULTIMATE THRILL RIDE. The new Talon 1000X is an excellent choice for anyone who wants to do it all. 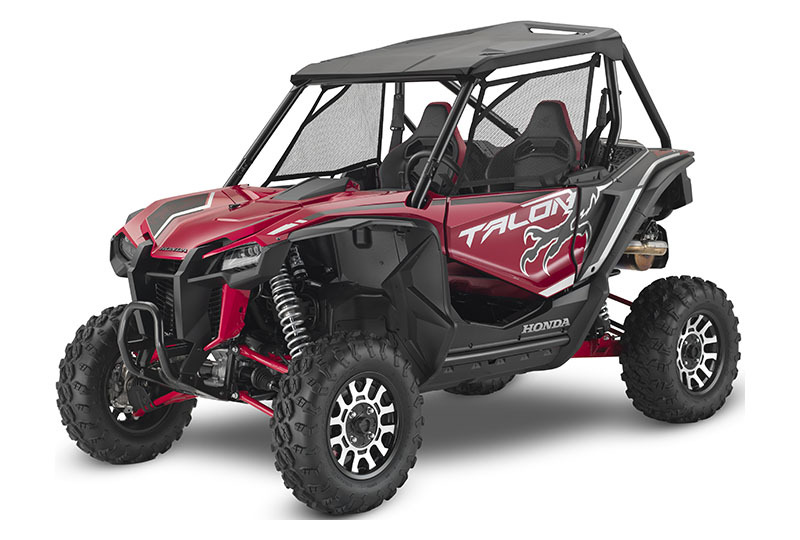 Both the Talon 1000X and the Talon 1000R share the same powerful, high-output engine, Automatic DCT Transmission, and I-4WD technology package, but the Talon 1000X is 64 inches wide and has an 87.6-inch wheelbase. It also uses a three-link rear suspension, which makes it a natural for owners who prioritize maneuverability and quick handling. Nobody knows better than you where you like to ride, so check them out then make your pick. 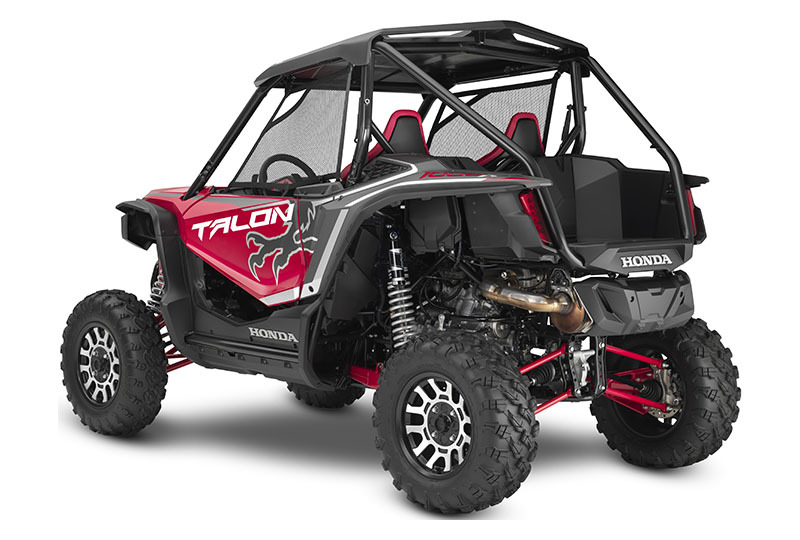 Either way, you really can’t go wrong when you choose a Honda Talon. 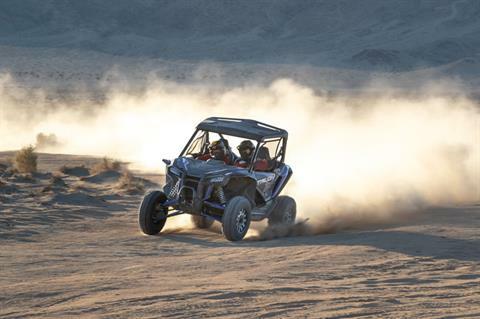 CHASSIS AND SUSPENSION: The Talon 1000X’s refined, high-performance chassis forms the basis for its superior handling and stability. From there we add long-travel independent front and rear suspension and generous ground clearance. Plus, the Talon 1000X gets premium, FOX Podium 2.0 shocks with QS-3 quick adjustors on all four corners. LONG-TRAVEL SUSPENSION: The Talon 1000X features Honda’s three-link rear suspension, with a whopping 15.1 inches of rear-wheel travel for a smooth ride and superior control. HIGH-PERFORMANCE DISC BRAKES: A high-performance side-by-side needs high-performance brakes. 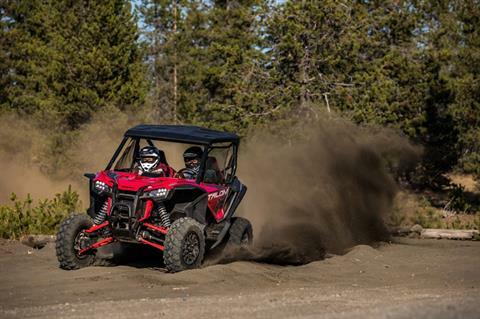 The Talon 1000X’s power, chassis and suspension travel helps take these side-by-sides to the next level. Front and rear the Talon 1000X features 250mm discs, with 34mm twin-piston calipers in front and 34mm single-piston calipers in the rear. Electronic Brakeforce Distribution (EBD) optimizes front and rear braking power under dynamic chassis conditions in two-wheel drive. INDEPENDENT FRONT SUSPENSION: Dual A-arm suspension gives you 17.7 inches of travel in the front. 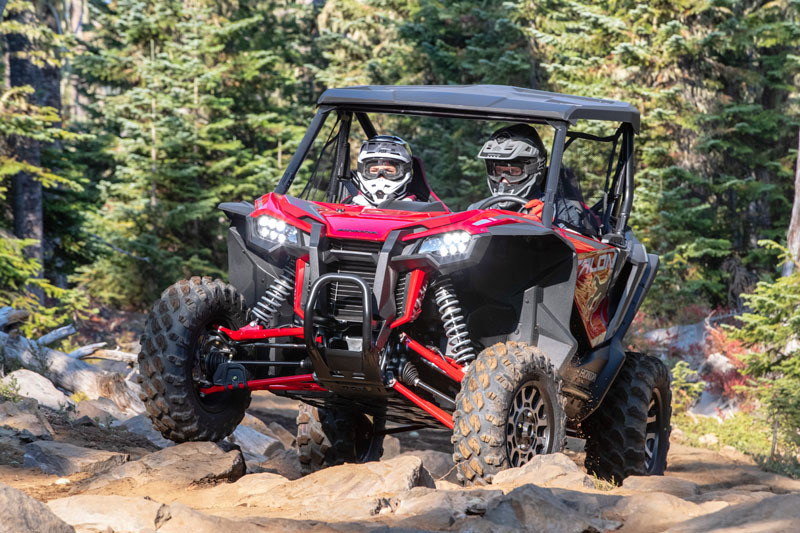 Pair that with stellar ground clearance and you begin to understand two reasons why the Talon 1000X handles so well and is so comfortable in rough terrain. TIGHT TURNING RADIUS: It’s all about superior maneuverability here. The Talon 1000X offers a narrow 17.4-foot (5.3 meter) turning radius for superior maneuverability on tight trails. 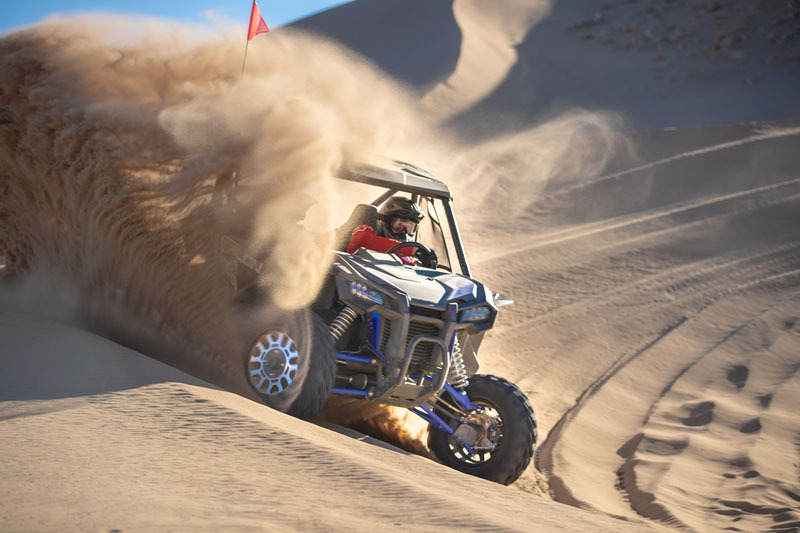 WHEELBASE: The Talon 1000X’s 87.6-inch wheelbase contributes to this sport side-by-side’s tracking, and also gives you a super-smooth ride. A bit shorter than the Talon 1000R’s, it places an emphasis on quick handling and maneuverability. FRONT / REAR WEIGHT BALANCE: Exhaustive testing shows that for serious sport driving, a slight rear weight bias is best. That’s why we set the Talon 1000X up with 44 percent of its weight over the front, and 56 percent over the rear. 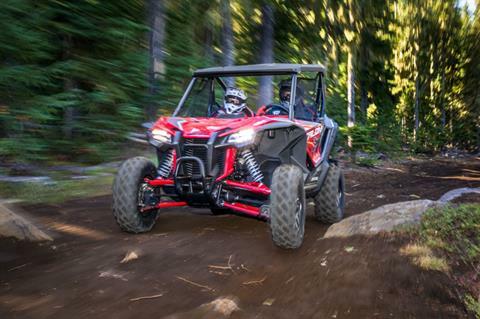 Uphill, downhill, over whoops and in g-outs, the Talon 1000X just flat-out works. DUAL-RATE SPRINGS: The Talon 1000X’s suspension springs offer soft initial travel, yet resist bottoming for both comfortable ride and control—the best of both worlds. SKID PLATES: Off-road driving is a tough pursuit, and Mother Nature can be harsh. Not to worry—we have your Talon 1000X covered. Literally. Generous skid protection armors vulnerable undercarriage and suspension components. Want even more? Check out our accessories lineup. FRONT BUMPER: Here’s something you can see and experience for yourself. The Talon 1000X’s standard front bumper offers a degree of vehicle protection some other side-by-sides lack. But this smart design doesn’t compromise performance, because it’s designed to slide smoothly over obstacles in rough approach conditions, enhancing off-road clearance and maneuverability while still offering good protection. RECOVERY HOOK POINT: Built in to the Talon 1000X’s chassis design, this attaching point makes it easy to secure your Talon 1000X for transport, and also makes it easy to hook up a recovery strap when your buddy on some other brand of side-by-side gets stuck. Make him buy you lunch as a payback. RUBBER-MOUNT ENGINE AND EXHAUST: Some of the most impressive Talon 1000X features are those you’ll never see. In addition to the suspension and ground clearance, we rubber-mounted the engine and exhaust system to insulate the cabin against excessive vibration. We also added a fourth engine mount, to add strength under high-performance driving operation. PAINTED BODY: Why paint and not color-molded plastic? Because the Talon 1000X’s painted body parts resist scratching better, and we know that where you’re going to be driving this side-by-side, you won’t want to slow down for a little brush by the side of the trail. Plus, they just look better—the first time you see a new Talon 1000X in person, we’re sure you’ll agree. PASSENGER “T” GRAB HANDLE: Your passenger needs a solid way to hold on, but it took the Talon 1000X to get this feature right. The passenger “T” handle is quick adjustable, but just as important it adjusts solidly and rattle free. HARD DOORS: The Talon 1000X's wide doors (standard equipment) make entry and exit easier. Plus, the doors use an automotive-style double-latch design that provides a secure, rattle-free feel. ROOF: Typical of Honda’s attention to detail, the Talon 1000X’s roof is specially designed to divert rainwater away from occupants. And unlike some others, it’s also designed to be aerodynamically cooperative when transporting the vehicle, whether you’re trailering it forward or backward. Standard equipment. TWIN-LEVEL PASSENGER FOOTRESTS: Some side-by-sides treat their occupants like they’re flying in economy class. Not the Talon 1000X. You’ve got acres of legroom here, even for six-foot-plus passengers wearing bulky boots. The special two-level passenger footrests let you brace yourself solidly over rough terrain, and stretch out when just cruising along. Designed to accommodate a wide range of passengers in comfort. COMFORTABLE SEATS: The Talon 1000X’s seats have been designed to be the most comfortable in the industry. They feature a wide 530mm seatback that’s 800mm high, and an even wider 540mm seat bottom. They don’t rattle. They don’t hold water. They offer tons of lateral support. And the driver’s side is positively adjustable to fit a wide variety of operator heights. They’re even compatible with four-point harnesses for competition use. 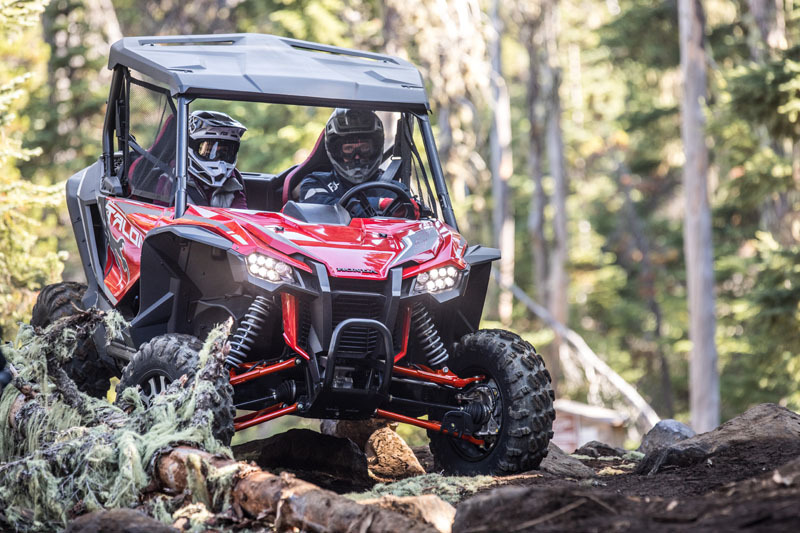 Your connection to your side-by-side starts here, and even before you start moving, you’ll know the Talon 1000X is the right ride for you. LARGE CARGO BED: Lunchtime? We’re on it. 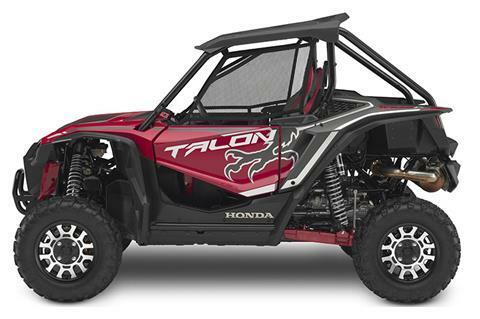 The Talon 1000X’s cargo bed sits up high, out of harm’s way and where it’s easily accessible. Big enough to easily hold a large 45-quart cooler with room to spare, it has a 299-pound capacity (that’s a lot of burgers) and features six strong tie-down points. INTEGRATED DOOR HANDLE: Another “small” detail, but one you and especially your passenger will come to appreciate. 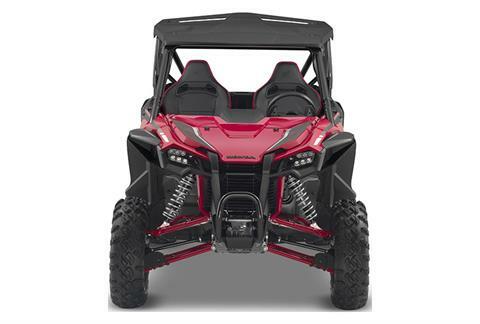 The vertically-inclined, integrated inner door handle style is another example of the premium the Talon 1000X puts on comfort and convenience. You’ll use it dozens of times each weekend, and wonder why all side-by-sides aren’t built this way. GENEROUS, SECURE CUP HOLDERS: Hey, we’re out here to have a good time, and who wants to be thirsty? And that means taking a beverage with you. The Talon 1000X’s twin cup holders securely hold the off-road standard, a 30-ounce tumbler, as well as plenty of other travel cups. 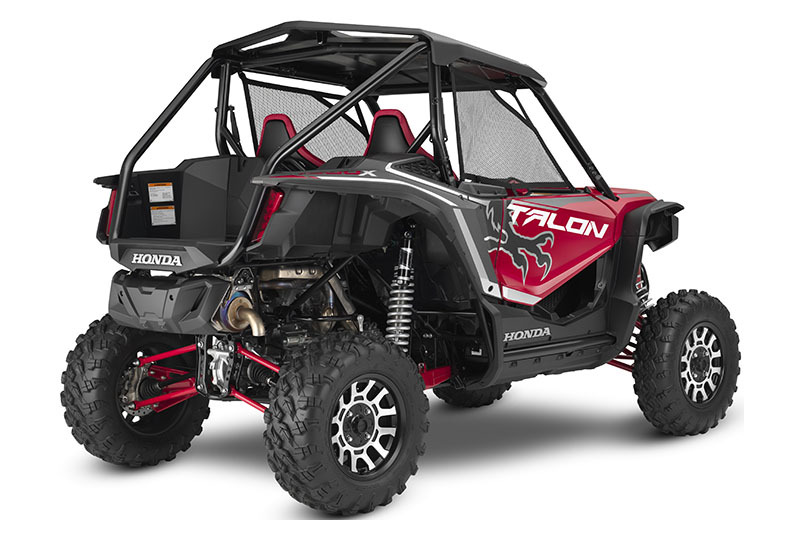 BUILT IN THE U.S.A.: The Talon 1000X is purpose-built for the American market, right in America. Domestically and globally sourced parts are all assembled at our plant in Timmonsville, South Carolina, and once these side-by-sides roll off the line, they’re ready to explore every corner of the country. I-4WD: The new Honda Talon 1000X showcases the second generation of our exclusive I-4WD system, specifically tuned to respond quicker and capable of delivering even more drive force. Think “I” for “Intelligent,” because that’s exactly what it is. An industry-first brake-traction control system for side-by-sides, it simplifies operation, increases drivability and optimizes traction. Using proven, advanced technology from Honda’s automotive division, you get the benefits associated with a locked front differential with none of the downsides. That means it maintains front-wheel traction even if one wheel wants to spin on ice or mud or if it’s in a hole. But at the same time, you get the lighter steering, better tracking at high speeds, tighter turning radius, and reduced kickback associated with unlocked front differentials. Special software tunes the I-4WD system for sport use. RELENTLESS DURABILITY: When it comes to strength and toughness, the Talon 1000X leads the way. The oversized 87mm CV joints, beefy 39.7mm propshafts and strong U-joints are all built to survive the loads that low-speed rockcrawling can generate—and which cause driveline failures in so many other side-by-sides. HILL START ASSIST: Need to stop on a steep uphill? 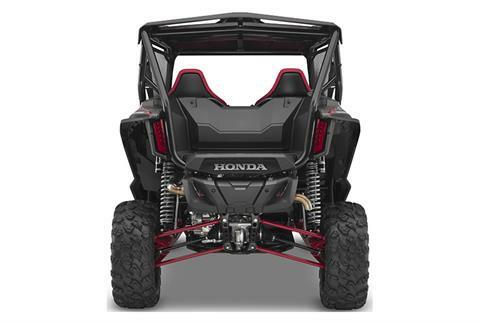 Honda’s Hill Start Assist automatically holds your Talon 1000X in position while you move your foot from the brake pedal to the accelerator—there’s no roll-back drama. It even works on the downhills, too! 2WD / 4WD / SHIFT ON THE FLY: Want to access as much traction as possible? Put it in I-4WD. Need maximum power at all four wheels? I-4WD eliminates the need for traditional locking differentials. Want to use 2WD for lighter steering or specific terrain? 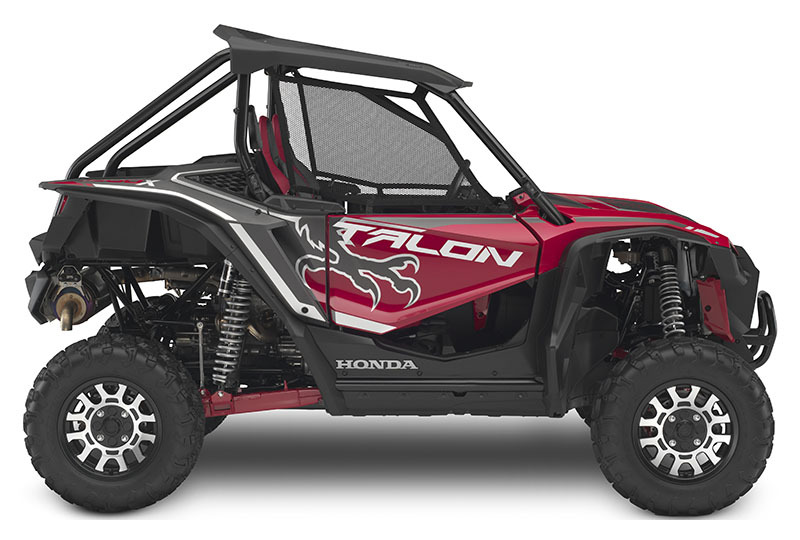 The Talon 1000X lets you do it all, and the best part is, you can do it all with the push of a button. CV JOINT BOOT PROTECTION: Tear a CV boot, and it’s only a matter of time until you’ll be making a costly replacement. That’s why we give the Talon 1000X’s CV joints double protection: First, we design them to tuck up tight covered by the suspension arms. Second, the CV joints themselves get a special guard to offer even more protection. SPIRAL RING AND PINION FINAL DRIVE: Spiral-cut gears in your Talon 1000X’s final drive mean the load is shared over several teeth, not just one, and that means they’re quieter and produce less vibration too. CONNECTED DRIVE FEELING: Compared to a CVT transmission, the Talon 1000X’s positive automatic DCT gearbox gives you a far more connected feel with your side-by-side. Combine that with the Talon 1000X’s responsive engine, and you’ll see why a Talon 1000X gives you a superior sense of control. ENGINE LOCATION: Balance is the key to great handling, and that’s why we put the Talon 1000X’s engine where we do. Mounted behind the cab, it results in an excellent, neutral weight distribution. 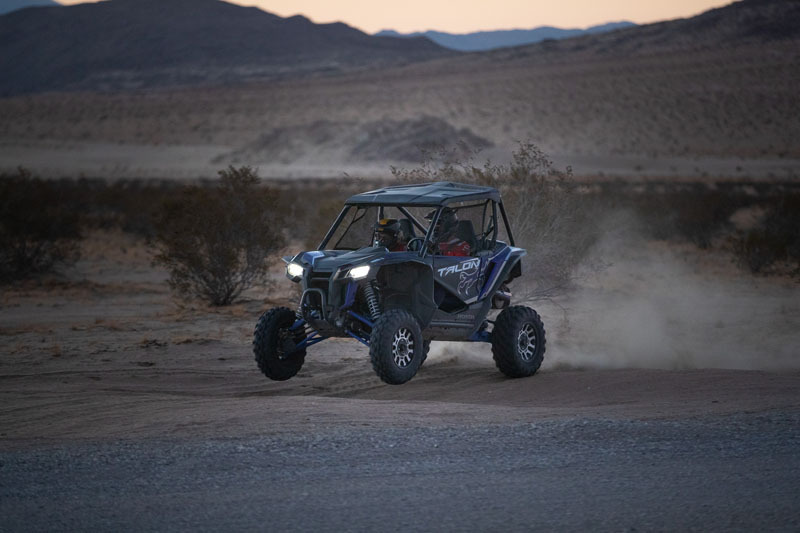 ELECTRIC POWER STEERING: Standard equipment on all Talon models, our Electric Power Steering system helps eliminate bump steer through rocky and rutted terrain, which reduces fatigue. What makes it even better is the added assist you get when you need it most, like when you’re in 4WD, driving at lower speeds, or maneuvering over rough conditions. And on the Talon 1000X, the system is specially tuned to give you just enough feedback for sport-driving. PREMIUM MAXXIS TIRES: Here’s where the rubber meets the road—or in this case, the trail. The Talon 1000X’s 28-inch Maxxis tires mount up on 15-inch alloy rims to provide excellent feedback and deliver better traction. We’ve selected them because they’re a great choice for a wide range of terrain too. POWERFUL 999CC TWIN-CYLINDER ENGINE: Sport side-by-sides need power, and you’re sure to find the new Talon 1000X offers plenty of it. The Talon 1000X’s 999cc liquid-cooled inline twin delivers the kind of powerful torque and quick-revving horsepower you’d expect from a flagship sport model, but is equally responsive in lower revs and in the critical midrange too. Set longitudinally in the chassis and managed by Honda’s sophisticated PGM-FI engine-mapping system, it delivers the kind of refinement no other side-by-side can match. UNICAM CYLINDER HEAD DESIGN: The Talon 1000X’s 999cc liquid-cooled inline twin uses the same proven Unicam® cylinder head design found in our championship-winning motocross bikes. That helps make the engine more compact, which lets us position it for optimal weight distribution and ground clearance. ROLLER ROCKER ARMS: Roller-tip rocker arms in the Talon 1000X’s valve train help reduce engine friction, facilitate higher, faster revs, and contribute to more efficient engine operation and power. They’re another example of Honda refinement you may not see, but that you’ll feel with every ride. HIGH LIFT, LONG DURATION CAMSHAFT: Giving the Talon 1000X’s engine a camshaft with high lift and long duration helps transform the engine. Better breathing helps the Talon 1000 make more power, and keeps that power coming all the way to redline. INCREASED THROTTLE BORE SIZE: Complementing the Talon 1000X’s potent camshaft specs, our engineers also gave the engine twin 46mm bores for more airflow and better breathing. You’ll feel it the first time you floor the throttle, and you’ll hear it too, with the Talon 1000X’s throaty intake roar. HIGH-FLOW FUEL INJECTORS: Here’s a math lesson that’s anything but boring: More air plus more fuel equals more power. 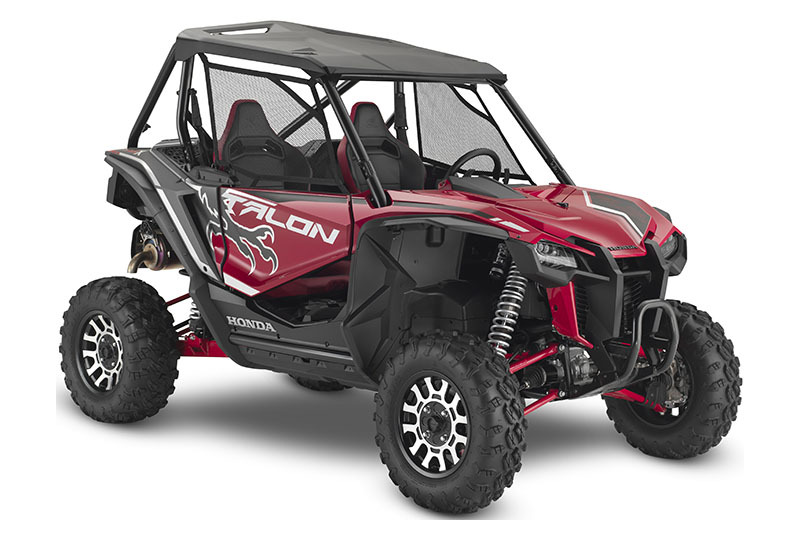 With the hot cam, throttle body and high-flow fuel injectors, the Talon 1000X’s engine is the total package for total off-road performance. OFFSET DUAL-PIN CRANKSHAFT: The crankshaft seems such a simple part, but it’s here that so much of the engine’s character is determined. By offsetting the cylinders’ two crankpins by 270 degrees, the Talon 1000X’s engine delivers a wide powerband and abundant torque. Counterbalancers keep everything running smooth. 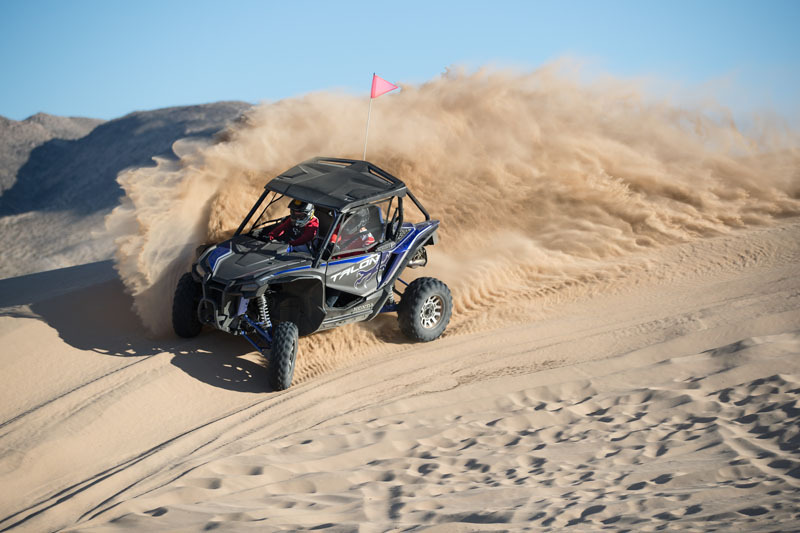 TUNED EXHAUST: The final part of the Talon 1000X’s balanced power equation: better breathing and more fuel delivery require an equally tuned exhaust system. The Talon 1000X delivers. Not only does it deliver some beautiful mechanical music, but it helps the engine deliver smooth, even power from partial throttle to wide-open running. HIGH CAPACITY COOLING SYSTEM: Rock crawling, deserts, dunes, and high-altitude operation can all challenge your side-by-side’s cooling system. That’s why we gave the Talon 1000X a seriously uprated system. Tested under the most arduous conditions we could find, you can rest assured your engine will remain cool, calm, and collected when the going gets tough. OIL-JET PISTONS: Another invisible example of Honda’s race-winning engineering. Squirting oil up onto the underside of the Talon 1000X’s pistons help them run cooler and seal better. The combination makes for longer piston life, and more power. The design also lets us use lighter pistons, for a faster-revving engine. 10MM CYLINDER OFFSET: By building the Talon 1000X’s engine with the cylinder bore 10mm in front of the crankshaft, we change the thrust forces on the pistons’ skirts and faces. That helps the rings seal better. It’s all part of the Honda story—numbers only tell a small part; design details like these make your Talon 1000X the best in class. SEMI-DRY-SUMP LUBRICATION: Proven in Honda’s racing engines, keeping engine oil away from the crankshaft helps eliminate windage losses. The semi-dry-sump design also helps ensure more positive oiling under the extreme driving conditions a Talon 1000X driver can experience. Better engine lubrication and longer engine life are the result. Six-speed automatic Dual-Clutch Transmission (DCT) with high / low subtransmission. Two drive modes with 2WD and I-4WD. Three shift modes (standard, sport, manual with paddle shifters).